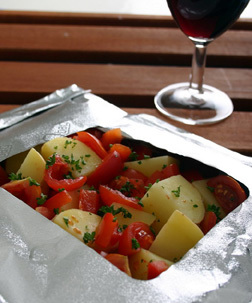 When cooked, the potatoes, peppers and tomatoes should be soft with the juices emulsified. Remove the clear film window and sprinkle with chopped parsley to serve and enjoy! Dice the potatoes, peppers, cut the tomatoes and mix in a bowl. Add the chopped garlic, saffron, salt and pepper. Squeeze with your hand to squash the tomatoes. Place into an open Qbag™ along with wine and olive oil. Carefully close the open end by folding by 1-2cm, twice, pressing down firmly to seal. In the Oven: Pre-heat oven and cook for 30-40 mins at 200ºC/400ºF, stirring halfway through. On the BBQ: Pre-heat BBQ to HOT. Cook for 25 mins.